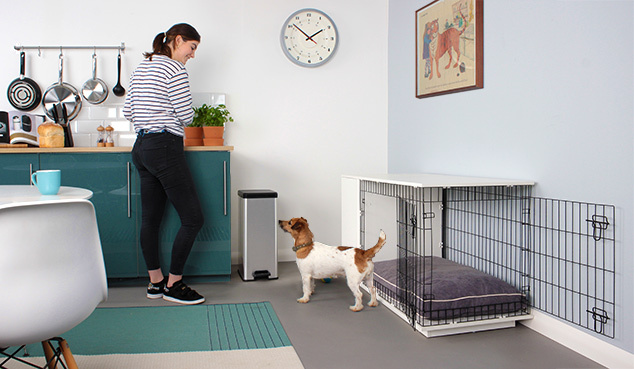 Designed as a piece of contemporary furniture, the fantastic new Fido Studio is more than just an indoor dog crate. 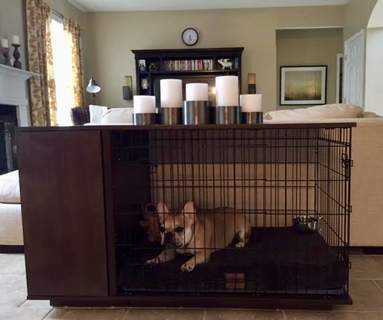 It's the perfect compliment to your home and fulfills your dog's natural instinct to have a den that they can call their own. 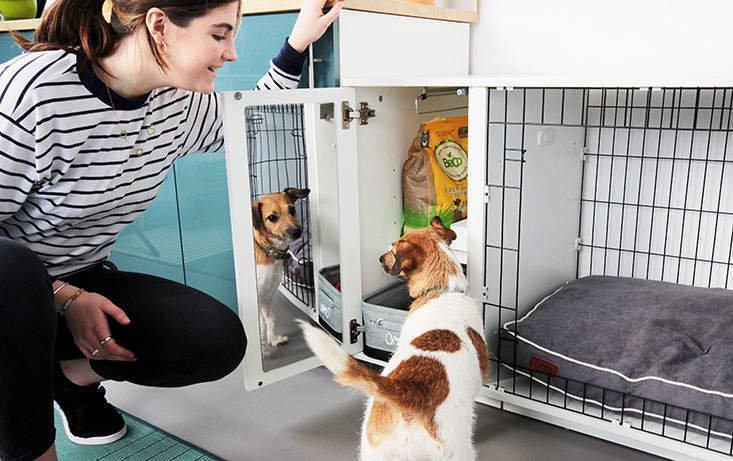 The Fido Studio also brilliantly solves the issue of where to store all of your dog's accessories. 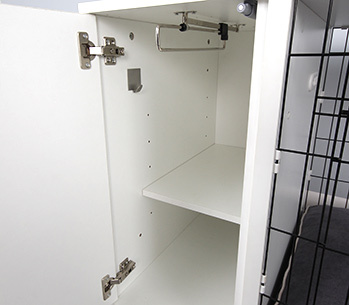 The optional wardrobe is a versatile addition to your dog crate furniture and an incredibly practical solution for storing your dog’s coat, treats, favourite toy and lead all in one handy place. 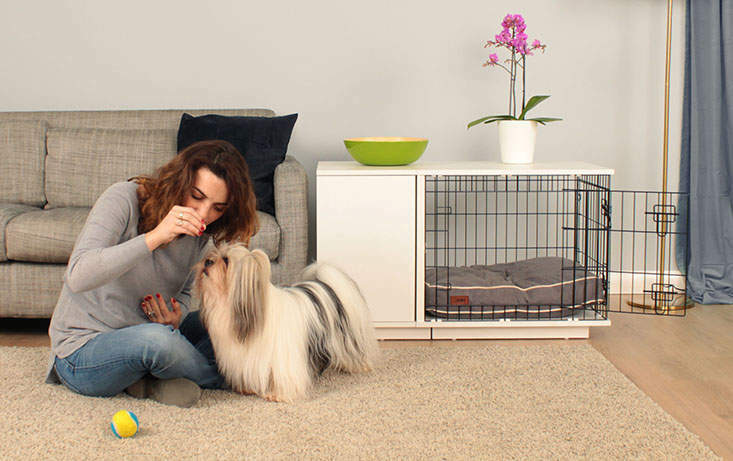 With the innovative Fido dog crate, your dog will have a comfortable and durable home for life. 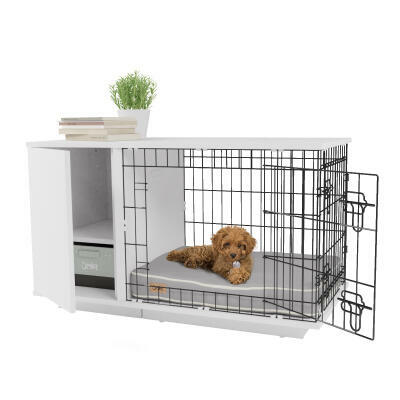 Whether you want a quality indoor house for your adult dog that is more than just a bed on the floor or are trying to train a puppy, the Fido dog house offers everything your pet needs to feel safe, secure and part of the family. 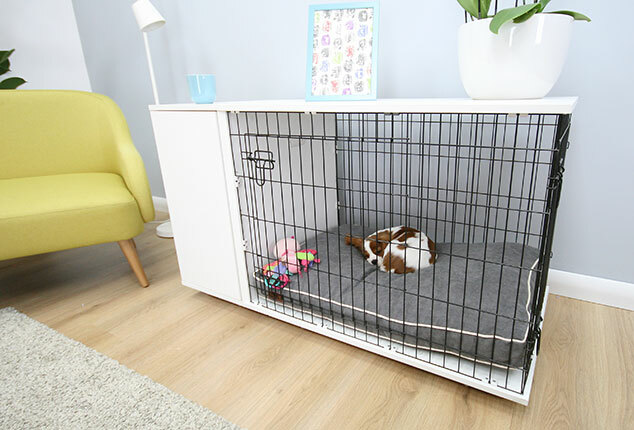 Available in two sizes, the smaller version is a designer 24 inch dog crate for breeds such as Pugs, Jack Russels and Dachshunds. 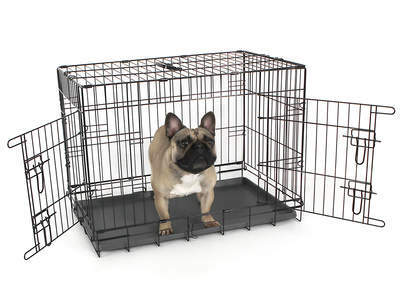 The larger version is a refined 36 inch dog crate that is ideal for breeds such as Spaniels, Bulldogs and Whippets. 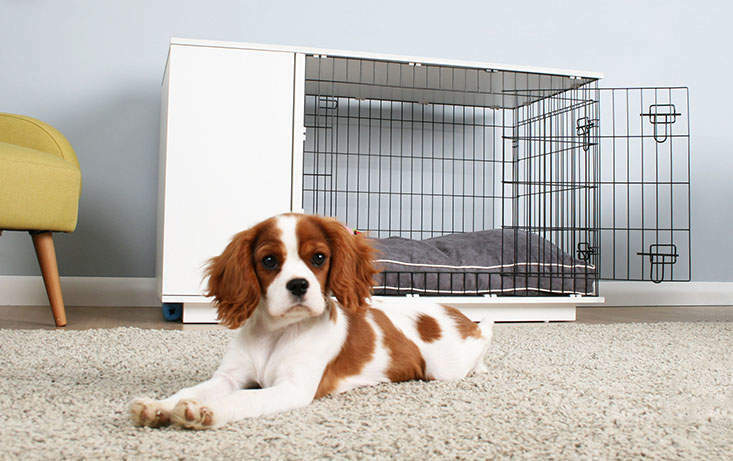 Both are an ideal starter crate for puppies that they can continue using as a modern, stylish adult dog home. 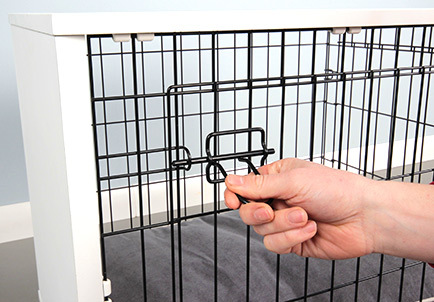 Using a crate to train your puppy or dog is the most effective method of training and is recommended by vets and professional dog trainers all over the world. 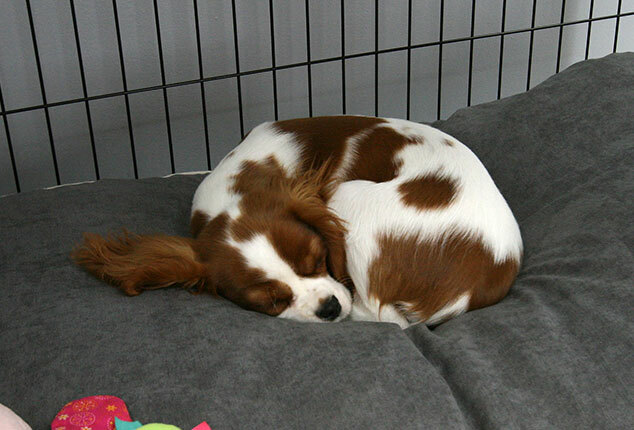 In fact if you are buying your puppy from a breeder then they will probably have already used a crate and the breeder will recommend continuing to use a crate. 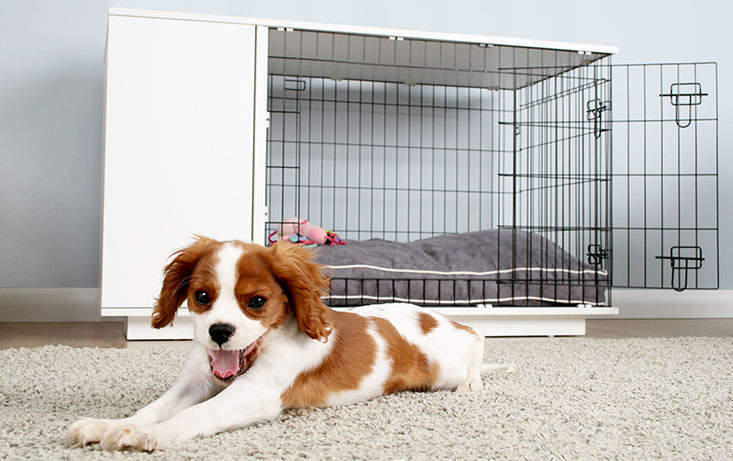 The main benefit is that a dog crate gives your puppy their own space within your home. This makes potty training and everything else easier. 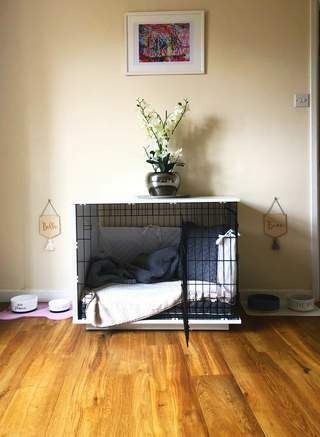 If you have young children, it’s also a useful way to create a quiet and relaxed space for your puppy. 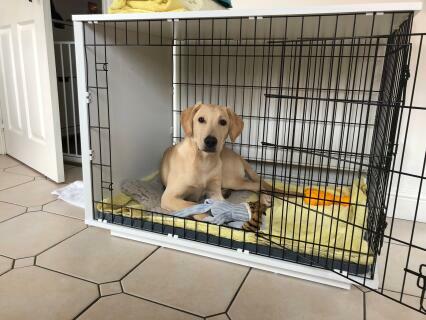 Crate training is, therefore, a great way for everyone to get to know each other in a safe and calm manner allowing your new puppy to have an area that is completely theirs to enjoy. Until now, dogs and a tidy home have not necessarily gone together. They come with a lot of accessories that are either left lying around or you have to put them into a kitchen drawer where they take up valuable space. The fitted wardrobe for the Fido Studio changes all that. 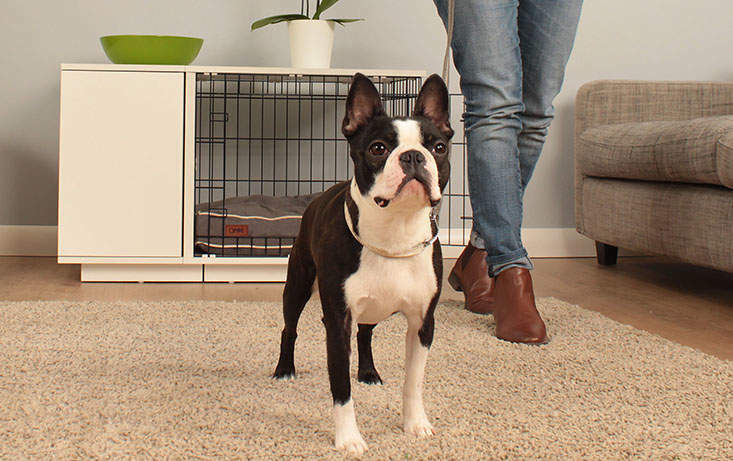 No longer will your pet’s coats be discarded on the floor, say goodbye to your dog’s favourite ball being a trip hazard in the hallway. 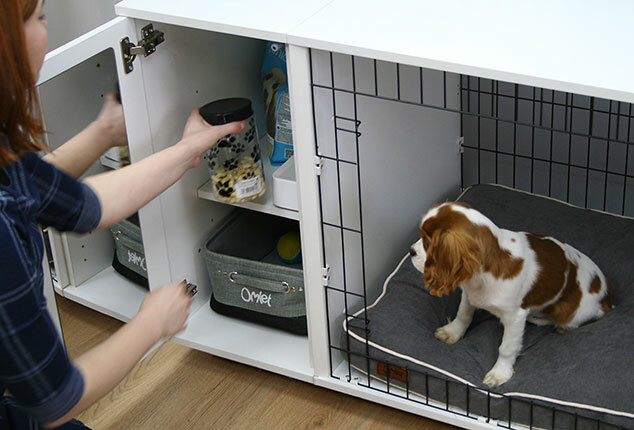 The wardrobe integrates beautifully with the Fido dog crate to create an elegant and incredibly practical solution. 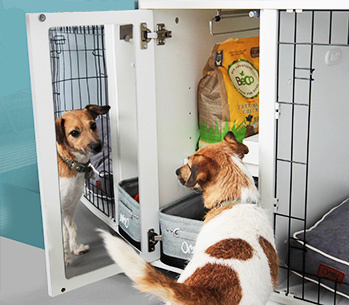 You can attach your wardrobe to the left or the right of your Fido Studio making it possible to fit into any space in your home. 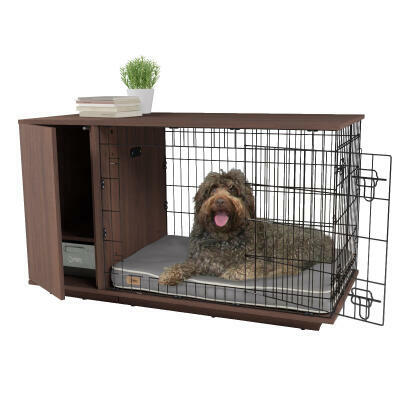 A Fido Studio is the ideal den for your dogs to relax in. 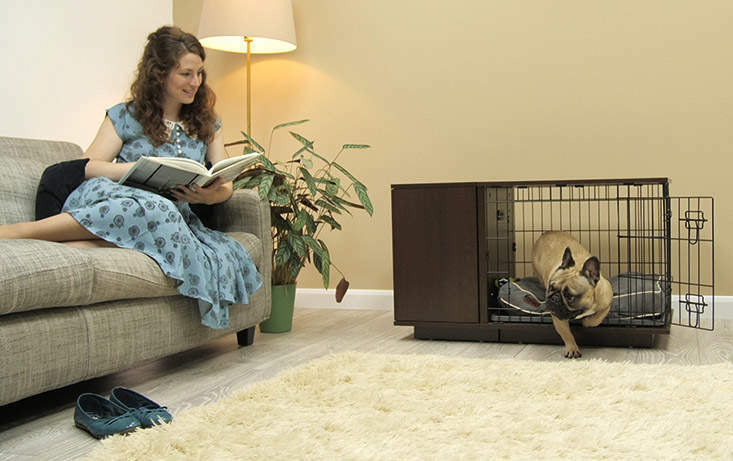 The Fido Studio dog crate satisfies your faithful companions deep rooted desire for a safe and snug den to curl up in. Dogs who sleep on a bed on the floor can be badly affected by drafts, direct sunlight and noise. All these things can cause your dog stress and at the very least make it difficult to get comfortable. 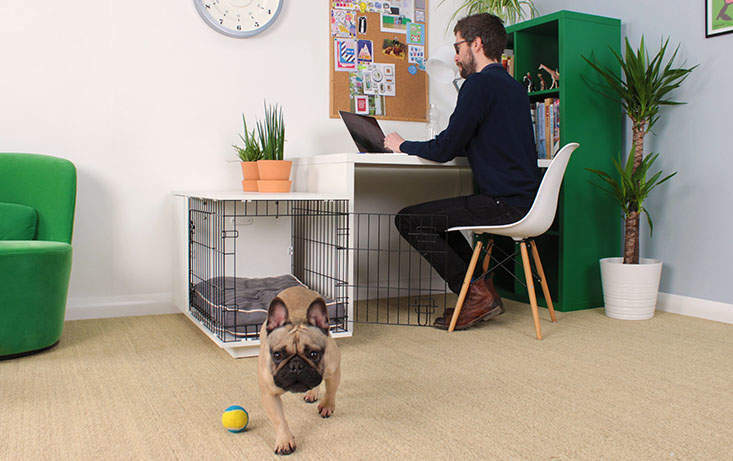 Raised off the ground the enclosed design of the Fido Studio can greatly reduce stress caused by environmental factors leading to a happier, more relaxed dog. After a long and exciting walk, there’s nothing a dog likes better than to have a nap. Tucked up inside the Fido Studio on the deep filled bed your pet can catch a long, luxurious 40 winks. 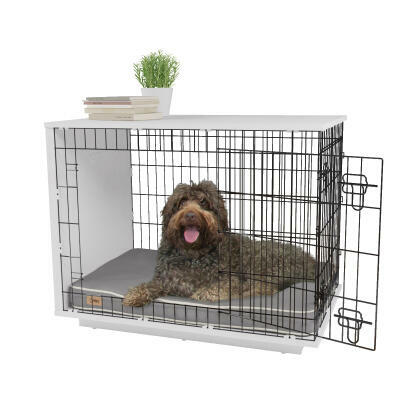 The Fido Studio fits perfectly into any room in your home. 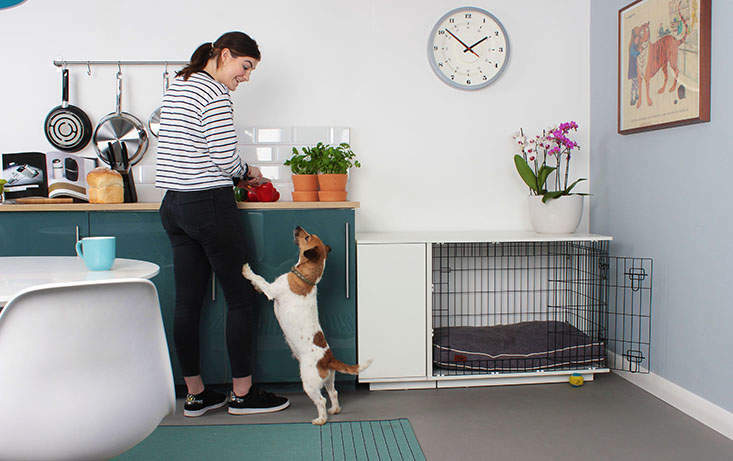 Both the Fido Studio 24 and the Fido Studio 36 dog crates are the perfect size to be used as a side table in your living room, kitchen or even bedroom. 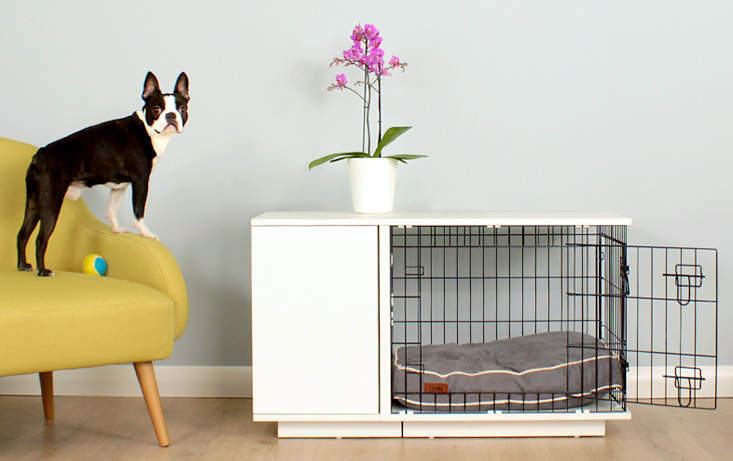 Unlike a normal dog crate, your Fido Studio integrates seamlessly with your other furniture. 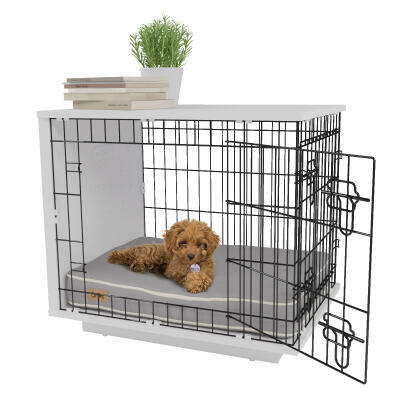 You can place your new dog crate in an area of the house that you would normally put your dog’s bed. If you have a new puppy you should choose a place where he or she can feel a part of the family such as the kitchen or the living room. 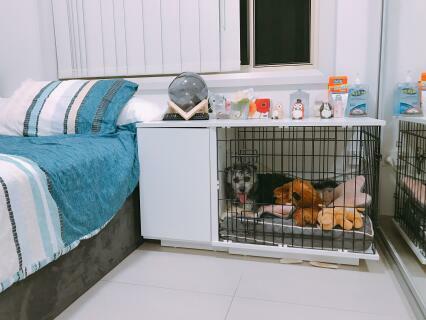 Not only will your dog love their new den, you will gain valuable space on top of the Fido which you can use for displaying items such as pictures. 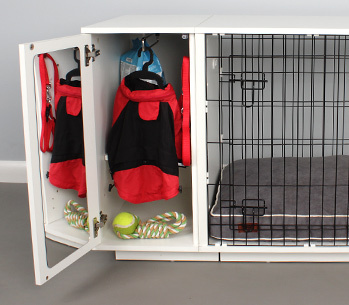 And with the addition of the wardrobe it keeps all your dogs things neatly in one place. 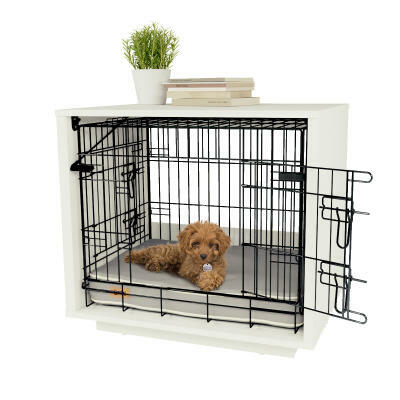 Wherever you choose to place it, you’ll love how the Fido Studio looks in your home. 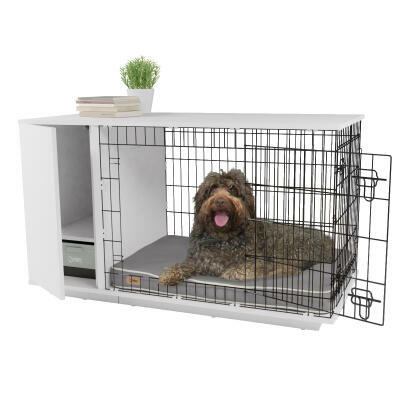 The Fido Studio is a great way to quickly secure your pet when you have visitors or perhaps young children who aren’t used to being around dogs. The latches are specially designed to lock in place when folded down. The heavy duty wire is coated with a durable black coating that looks chic and sophisticated. 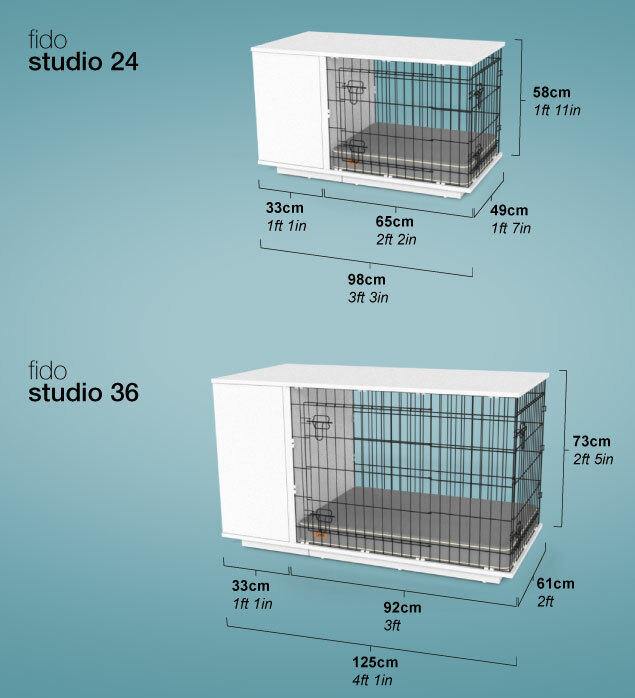 The Fido Studio is a secure environment for your dog. The Fido Studio comes with 2 doors as standard.. The Fido Studio has a door in both sides so you can place it either along or at right angles to a wall and still have easy access. 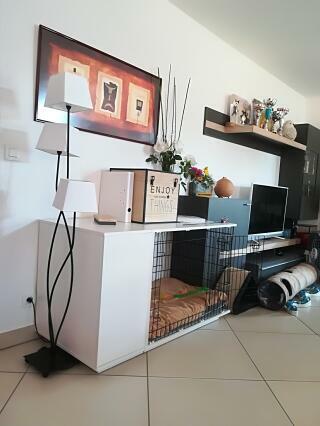 For example you might have a spot along the side of your sofa where the Fido Studio dog crate would make a perfect coffee table and dog bed in one! 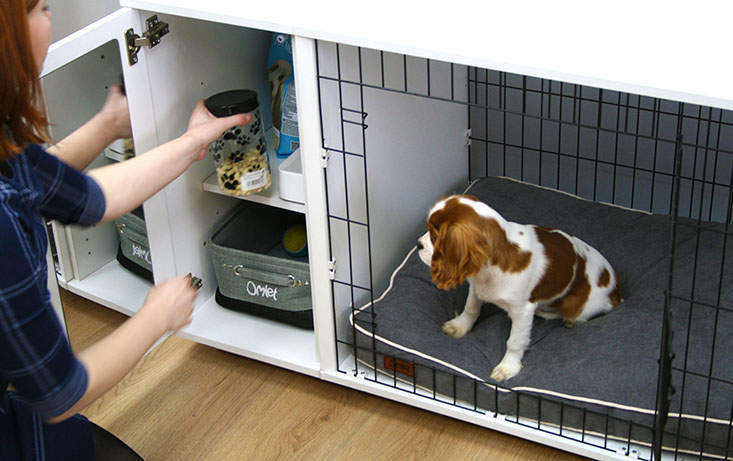 The optional wardrobe keeps your dogs lead, clothes, treats, toys and food nice and tidy in one place. 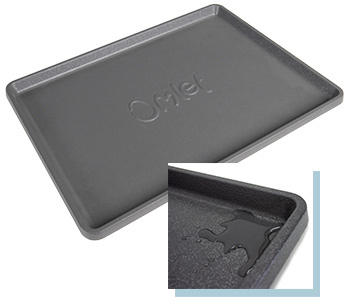 This tough, plastic tray will catch any spills making cleaning quick and easy. 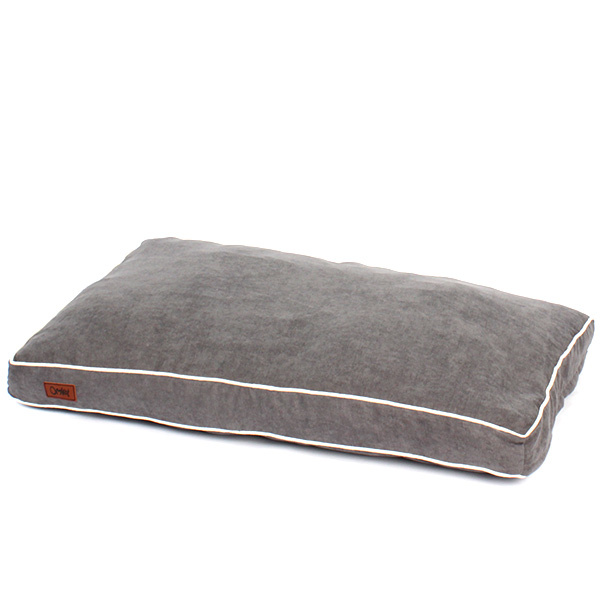 This extra deep filled bed is designed to fit exactly in the Fido Studio and has a removable machine washable cover. Keep toys, grooming kit, towels, treats and other accessories in this large basket. Finished in a two tone grey and with a second easy to wipe liner, it’s a really useful addition to the Fido wardrobe. 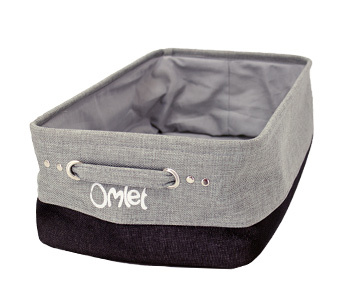 Comes with a handle at each end to make carrying easy and has the distinctive Omlet logo screen printed on it. We have mirrors, why not dogs? Let them take a moment to adjust their hair before going on a walk. The mirror is made from 2mm thick safety acrylic. Get the most out of your Fido Wardrobe with the optional clothes rail. Sort your dog’s clothes into seasons and make it easy for your pet to choose todays outfit! If you are not using the clothes rail then the optional shelf is a handy way to divide the wardrobe into different areas. Using the pre-drilled holes it can be positioned at different heights too. There's A Fido for the car too! 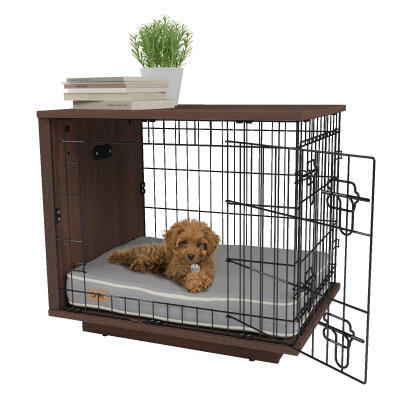 A Fido Classic is a great option if you want to take your dogs crate with you. When your puppy is crate trained it makes perfect sense to use a crate for car journeys. A sister product to the Fido Studio, the Fido Classic is the perfect way to safely transport your dog when you are travelling somewhere. 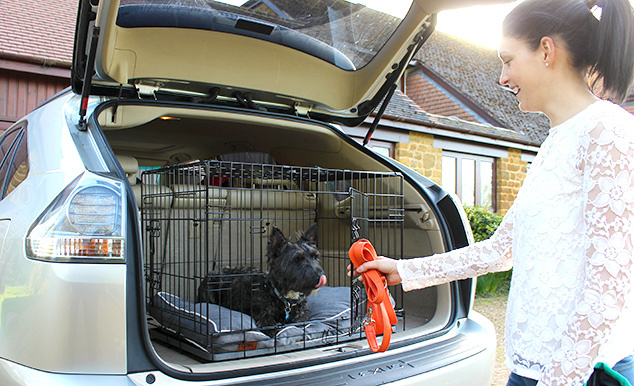 The Fido Classic is lightweight and easy to pop up and down with no tools and it comes with a handy clip on handle which makes carrying the crate easy. Leave it in the car so it's always ready and you don't have to remember or have the inconvenience of lifting it in and out each time. Click here to shop the Fido Classic collection. 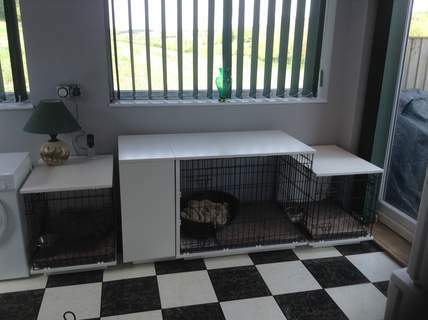 The Fido Studio is currently available in a 24inch and 36inch size, to suit small and medium breeds respectively. Breeds up to 11kg / 25lbs such as the Lhasa Apso, Yorkshire Terrier, Chiuaua, Pug and Pomerianian are all suitable for the Fido 24. The Fido 36 will provide ideal accomodation for dogs up to 32kg / 70lbs including, Spaniels, Whippets, and Bulldogs. Click here for a guide to over 200 dog breeds. 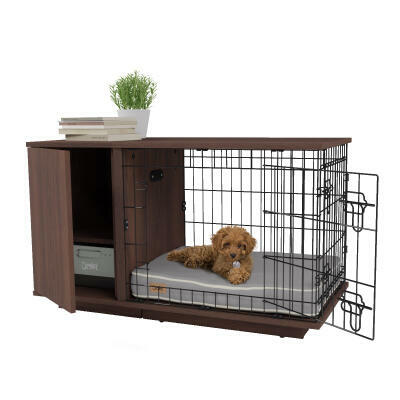 We ordered the Fido Studio 36 as an upgrade to our dog's current crate. He'd had previous since being a puppy and needed a bit more room. 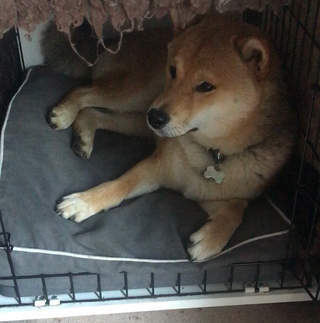 He absolutely loves his new 'bed'. 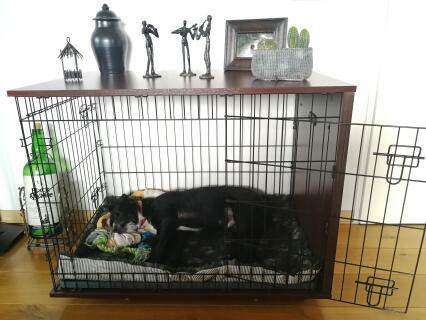 He spends so much time in there during the day, even though he used to only go in his old crate at night times. Now he chooses to go in at any opportunity, its safe, cosy but still offers him enough space to be comfortable. It looks really attractive and have had many positive comments from visitors. The wardrobe is perfect for keeping all his bits and pieces in, and an easy go to for all the family to find his belongings. 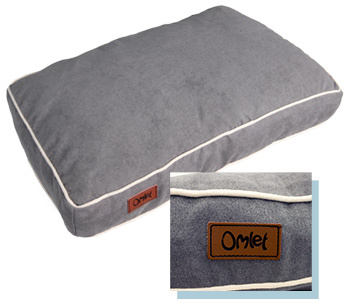 I'd definitely recommend this product to anyone that wants a little bit of luxury in their dog's life. Hi I’m still waiting for a replacement piece that has been sent for the second time. So far the top piece has been delivered damaged on two occasions. The packing boxes seem very thick and strong l can only assume the damage is done in transit. Awesome product that would suit any decor. My puppy loves it as she feels secure and knows it is the cue to go to sleep. Would recommend this quality product. Great service and crate. Beautifully made, easy instructions to follow when assembling. 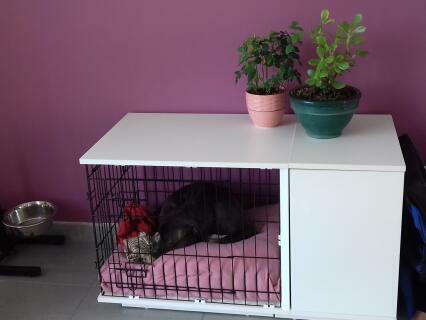 Dog loves it, which was most important :) Looks very stylish, very happy customer!